This 2 day training is similar to the previous “RESQ Level 1” workplace First Aid training. 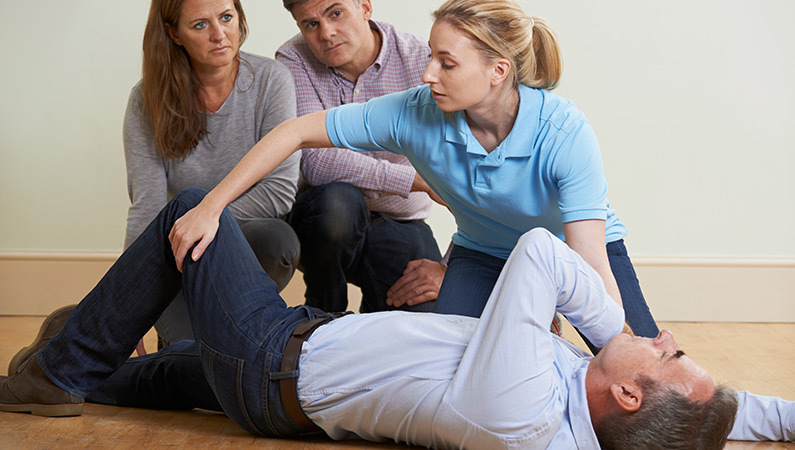 It includes the Swiss Resuscitation Council certification in Basic Life Support and Automated External Defibrillation (BLS-AED-SRC Generic Provider) and training in Basic First Aid Skills. Legal obligations around First Aid provision in Switzerland. How to evaluate and react during a medical emergency situation. How to give Cardio-Pulmonary Resuscitation (CPR) to babies, children and adults. How to use an Automated External Defibrillator. How to manage someone having a seizure. Important risk factors for cardiovascular disease. Head injuries and suspected spinal injuries. Plus, what to have in your First Aid Kit and how to use it. Participants will then use their newly acquired skills during realistic group scenarios. Their knowledge gained will also be examined during a written test.